This flagship router from ASUS offers a powerful N wireless network as well as Gigabit Ethernet connectivity. Even though it has advanced features such as build in bit torrent client and print server, we will be looking at it with VPN access in mind. The Asus router comes with DDWRT firmware pre flashed on the device, which means that it can connect to VPN directly. This allows devices such as the Apple TV, Roku Box, Gaming Consoles, DVD Players and set top boxes without a VPN client access to use a VPN connection. 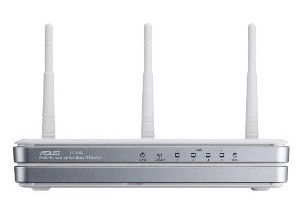 When looking for a VPN router to drive the DDWRT software it is important to look at the routers specs and with 480MHz (capable of 533MHz) processor, 128MB RAM, 32MB ROM the ASUS RT-N16 perfect for connecting to VPN. The setup of all DD-WRT routers is the same more or less and I suggest that you take a look my tutorial here that explains the setup from start to end. At only $89 from Amazon the ASUS RT-N16 is very cheap and the hardware is more than capable of providing a stable and fast VPN tunnel. The only drawback is that the router is not Dual band so it wont be able to support access for both G and N driven devices at the same time, and once a G driven device connects to the router it will lower the speed. However, this has no effect in day-to-day usage, as a G network will still be faster than your Internet connecting. You will only find this a problem if you use the NAS capabilities of the router. Then you wont get access to the network drive at full N speed. All in all a very stable router that can provide a great VPN tunnel for your Apple TV, Gaming Console etc. – perfect for unblocking and Hulu.